POST GRADUATE INSTITUTE OF MEDICAL EDUCATION & RESEARCH PGIMER , GOVERNMENT OF INDIA , DR. RRM MANOHAR LOHIA HOSPITAL, NEW DELHI , published the official Recruitment Notification No. 1-212014/Admn / PGIMER , for the recruitment of various posts. selection of the eligible candidates will be based on through the personal interview test. PGIMER, Dr. RML Hospital, New Delhi proposes to engage Assistant Professors (Teaching Specialists) in disciplines mentioned below purely on contract basis initially for a period of one year or till regular incumbent joins, whichever is earlier, on a consolidated monthly remuneration of Rs. 70,0001- (Rupee Seventy thousand Only). Selection procedure : through the personal interview test. Personal interview test will be held on 11 November 15 November 2014. How to apply : Suitable and willing candidate may attend walk-in-interview and report at the Office of Registrar, POIMER, 7° Floor, Administrative Block by 9.30 am. positively with the application in the prescribed form along with 6 passport size photographs, original and photocopies of relevant documents. Application Form fee : The application forms should be accompanied with non-refundable Demand Draft/Indian Postal Order of Rs. 500/- for unreserved and OBC candidates and Rs. 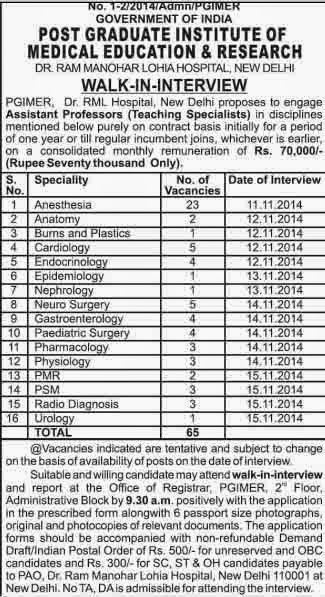 300/- for SC, ST & OH candidates payable to PAO, Dr Ram Manohar Lohia Hospital, New Delhi 110001 at New Delhi.